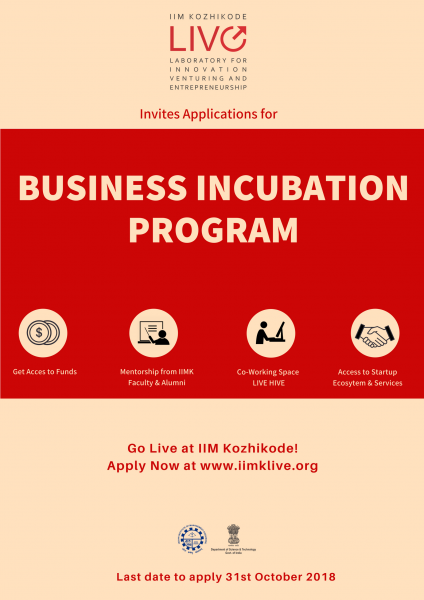 IIMK LIVE is a Business Incubator and Entrepreneurship Development Center of IIM Kozhikode with the support of Department of Science and Technology, Government of India. Established in June 2016, the center is envisioned to function as a Business Incubator with a purpose of creating a National Center of Excellence that promotes innovation, new business venturing and entrepreneurship. It seeks to emerge as a collaborative platform that helps transform innovative ideas into business ventures that make significant economic and social impact. Towards this effort LIVE, in its three cohorts, are incubating 29 startup organizations across sectors having innovative ideas supported by strong team and a vision to contribute to the ecosystem. LIVE is now inviting applications for admissions to its Business Incubation Program (BIP/18/R2). 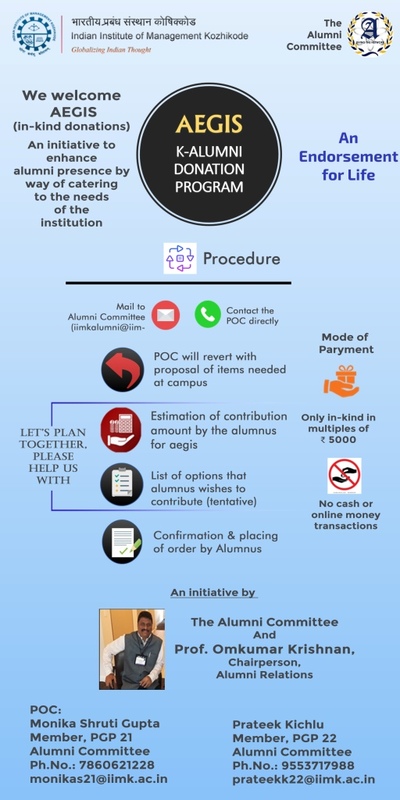 Interested entrepreneurs may apply before 31st October, 2018 by registering on the website www.iimklive.org and submitting the application form after completing all the details. Incubation program at LIVE promises smart co-working space, vibrant community, systematic and intensive mentorship, business services, training, networking opportunities, access to funding and everything that can help Start-ups survive the challenges of starting a business and turn them into a great deal of excitement. So, Go LIVE at IIM Kozhikode!